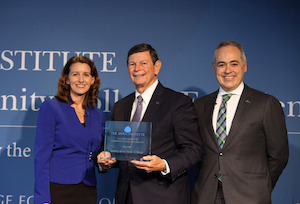 WASHINGTON — Indian River State College (IRSC) and Miami Dade College (MDC), both in Florida, are the co-winners of this year’s 2019 Aspen Prize for Community College Excellence, a national recognition from the Aspen Institute highlighting their outstanding commitment to student success and equitable student outcomes amongst a pool of 1,000 community colleges across the country. 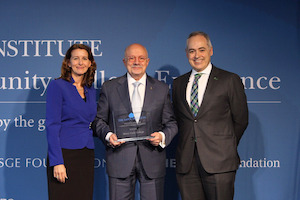 Indian River and Miami Dade were joined by eight Aspen Prize finalist institutions who were all recognized Tuesday at a ceremony at the Newseum’s Knight Conference Center in D.C. Three colleges — Odessa College, Palo Alto College and Pierce College Fort Steilacoom — also received Aspen’s “Rising Star” award for dramatic improvement. The two Aspen Prize winners will receive $350,000 each for their achievement and the three “Rising Star” award winners will each receive $100,000. “This award is an affirmation of what we’ve been aspiring to for so many years at MDC, mainly to ensure open access and academic excellence can go hand-in-hand,” said Miami Dade College president Dr. Eduardo J. Padrón who is retiring this year. Dr. Edwin R. Massey, president of Indian River State College (IRSC), said in the institution’s acceptance speech that student success is the most important thing at the college. By placing student success at the forefront of every conversation — and redirecting conversations that shift away from this priority — the college has transformed the culture to one where students feel and are important, he said. “That has really driven the institution forward,” Massey said of the student-centered work at IRSC. Joshua Wyner, founder and executive director of the College Excellence Program and an Aspen Institute vice president, noted that the world of education can learn much from community colleges, particularly around how the institutions play a role in knowledge creation and community and international problem-solving. In addition, others in the higher institution realm can look to community colleges as models on how to engage students early on in high school; how to provide a low-cost, high-quality education that is close to home for many students; how to prepare students to seamlessly transfer to four-year institutions or the workforce; and significantly, how to be “anchors” and “elevators” in their community, Wyner said. The 10 Aspen Prize finalists, he said, are “elevators” for students, their communities and their regions. Prize Jury co-chairs Kathy Warden, CEO and president of Northrop Grumman, and Dr. Àngel Cabrera, president of George Mason University, listed the significant accomplishments of each Aspen finalist institution, and added that it is important to recognize the institutions for the work they are doing — efforts that other colleges can aspire to, Warden said. Jury members selected award winners based on finalists’ strengths and successes in four primary areas: completion and transfer, labor market, student learning and equitable access and success for historically underserved groups. Indian River, a 2015 Aspen Prize finalist and 2017 Finalist-with-Distinction, was recognized for its efforts to sustainably improve student success rates. The college has a 56 percent transfer rate compared to the 32 percent national average, and a 52 percent bachelor’s attainment rate for students who go on to transfer, which is 10 points higher than the national average. IRSC’s outcomes are the result of a student-centered culture, early and strong advising and clear pathways to transfer. Significantly, the college built 17 bachelor’s degree programs in-house and has established strategic relationships to meet regional economic needs. Miami Dade’s efforts around student success center on economic and social mobility. The college’s diverse array of students include 17,000 immigrants from more than 150 countries and most students are low-income and first-generation students. MDC graduates and prepares students for transfer at a rate of 43 percent, and the institution has a 47 percent bachelor’s attainment rate for transfer students, five points higher than the national average. Both schools’ graduates out-earn their regional counterparts one and five years after graduation. At Odessa College, the combined graduation and transfer rate for first-time, full-time students jumped 21 percentage points in the last five years and the student withdrawal rate sits at a “record low” of 1.8 percent, Aspen officials said. Similarly, Palo Alto College in Texas raised its combined graduation and transfer rates for first-time, full-time students from 28 percent to 47 percent by creating a comprehensive advising system and adding more student advisers, among other initiatives. And Pierce College Fort Steilacoom is making strides in student retention and completion with a first-time, full-time combined completion and transfer rate of 59 percent — 20 points higher than the national average. Their success is attributed to leaders’ “bold and ambitious goals” to promote student success by eliminating microbarriers for students, including providing emergency aid or transit passes, offering childcare and eliminating arbitrary fees. However, Wyner said building clear maps for transfer and advising students is not enough, pointing out that students come to community colleges for a better life for themselves and their families. The 10 finalists for the 2019 Aspen Prize for Community College Excellence included Broward College, Indian River State College, Kingsborough Community College (City University of New York), Miami Dade College, Mitchell Technical Institute, Odessa College, Palo Alto College, Pasadena City College, Pierce College Fort Steilacoom and San Jacinto College.